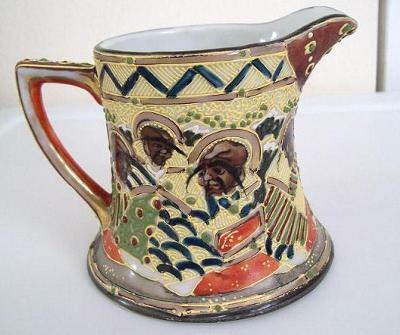 I would like to know more about the manufacturer and value of this pitcher, which my grandmother brought back from China in 1894. It is about 5" tall and the decoration is raised. The manufacturer's mark sounds like xiao dian si, according to my Chinese teacher's pronunciation. You could be right (and probably are). The steamer stopped at Yokohama to/from China. I have letters to my great-grandmother from missionary friends who did their shopping for tea sets in Japan when they were on furlough from their Chinese mission. Thank you for your input! The is not anything traditional Chinese and couldn't be from 19th century China. 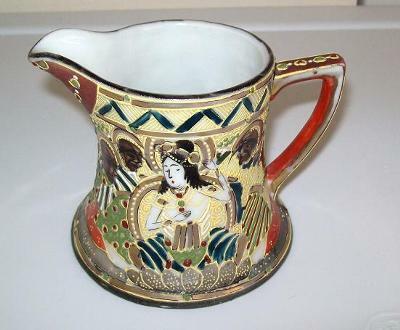 The painting style is reminiscent of Japanese styles.